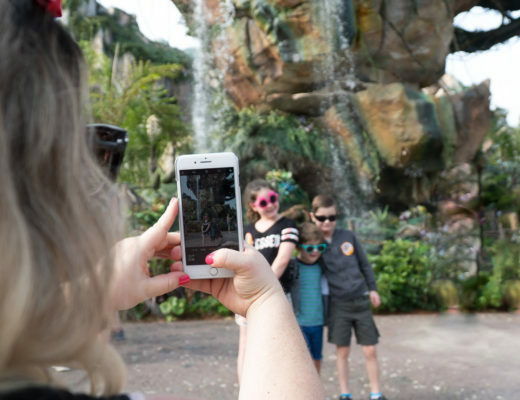 This is a sponsored post written by me on behalf of Visit Orlando. All opinions are 100% mine. Ever since I was a small child, I’ve been travelling to Florida with my family. 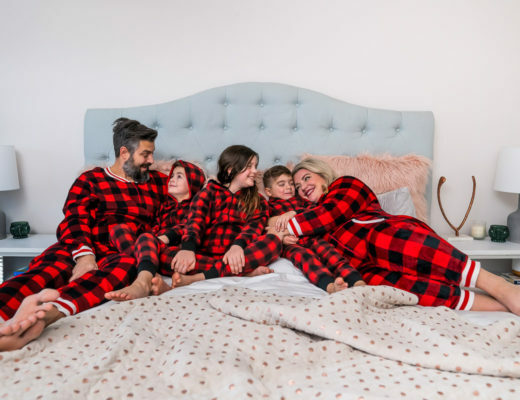 Both sets of grandparents were “snowbirds” – people who live in Canada during the summer months and then migrate down to Florida for the winter months – had homes in southern Florida that we would visit yearly. We actually had gone so many times during childhood that by the time I was a teenager, I couldn’t remember one single white Christmas because we had been in Florida for all but one! So while I’ve never had a permanent residence in the sunshine state, I do feel as though it’s a second home of sorts and feels very welcoming and familiar to me whenever I go back! While neither set of grandparents lived in Orlando, we did visit quite often as children with our parents to see the various attractions. So you can imagine how full circle of a moment it is to now be taking my own kids to visit many of the sights and sounds that I did over 25 years ago! 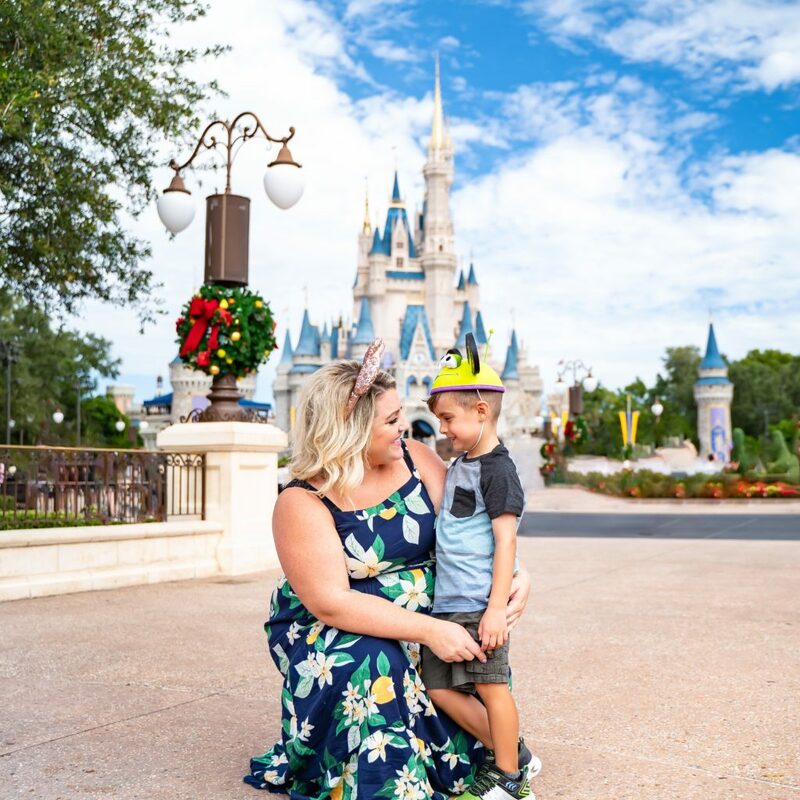 On our most recent trip down with Visit Orlando, we got to not only check out a few of the bigger parks but also some of the lesser known attractions and today we wanted to share with you our list of SEVEN of the most family-friendly places you absolutely MUST-SEE next time you are in Orlando, Florida! I visited this theme park when I was about 12 years old and back then, it was still named “MGM Studios.” I can remember even then loving the park, with the newly introduced Toy Story parade (I still have pictures of me with some of the characters) as well as seeing Beauty and the Beast on stage (my favourite Disney movie). 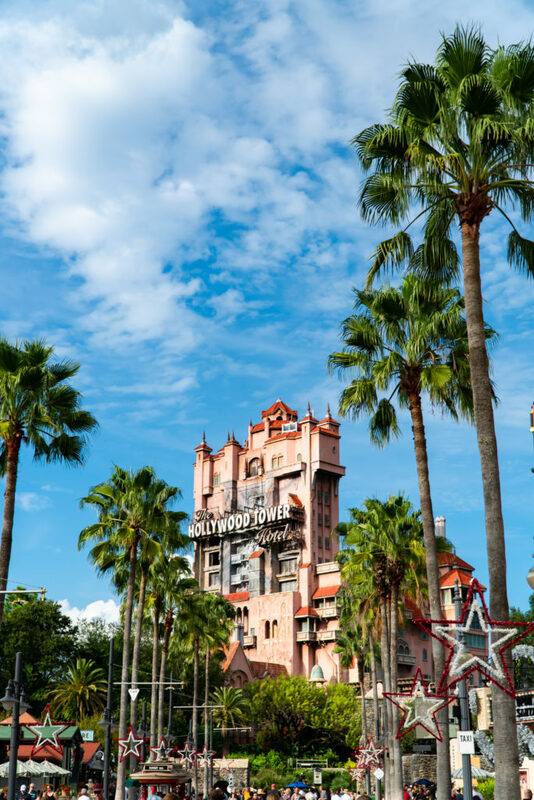 I can even remember riding the Tower of Terror as a pre-teen and loving every minute of it! While the park has not only changed its name and quite a bit of its appearance since then, many of the attractions remain the same, including the Beauty and the Beast show! I was super excited to take the kids to this park and see it again after all these years. 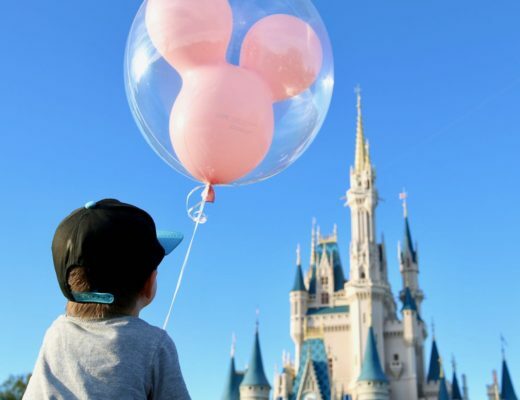 It was honestly even more spectacular than I remember and quickly became one of our family’s favourite Disney parks in Orlando! The park itself is significantly smaller than the likes of Magic Kingdom or Animal Kingdom which means the crowds are more manageable along with the wait times for rides. But the attractions are still top notch and there is still a very “Disney” vibe to the park. 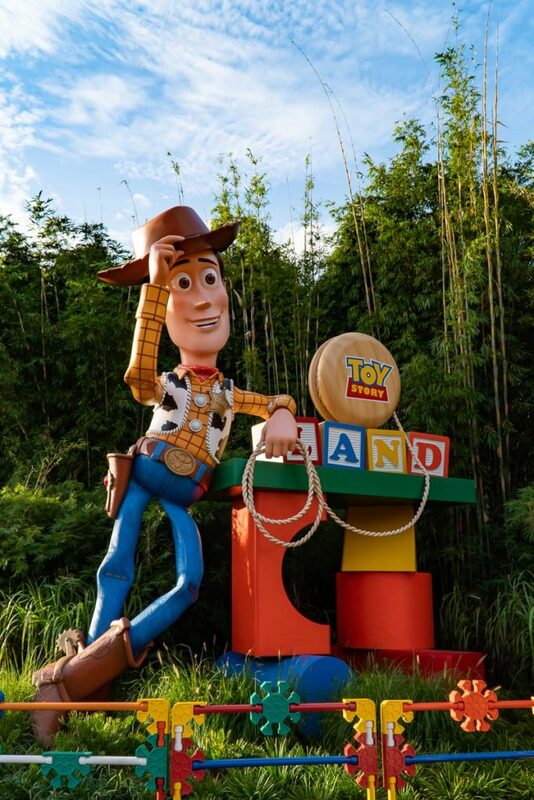 We got to explore the newly opened Toy Story Land where the kids rode on the Slinky Dog Coaster and the Alien Swirling Saucers. It’s literally like stepping into the movie, complete with the green soldier men walking around amongst the crowds! Walking down Hollywood Boulevard was nothing short of spectacular, with the Tower of Terror at the end of the road and the perfect lined palm trees on either side of the street leading all the way to the tower. The art deco vibe on all the buildings was another feature Chris and I thoroughly enjoyed! I guess the Disney parks had just set up for their Christmas season two days before we visited, which was such a great surprise for us to experience! 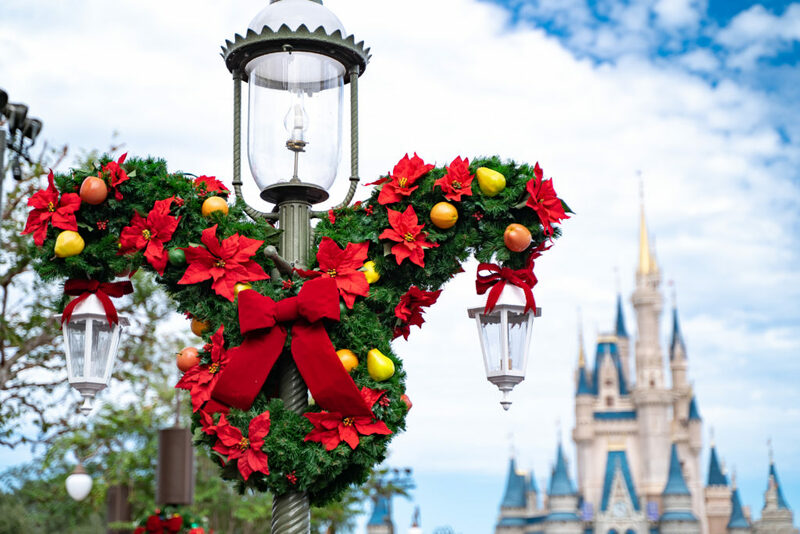 I mean, Disney is already magical on its own, but add in some Christmas sparkle and it’s a whole other level! 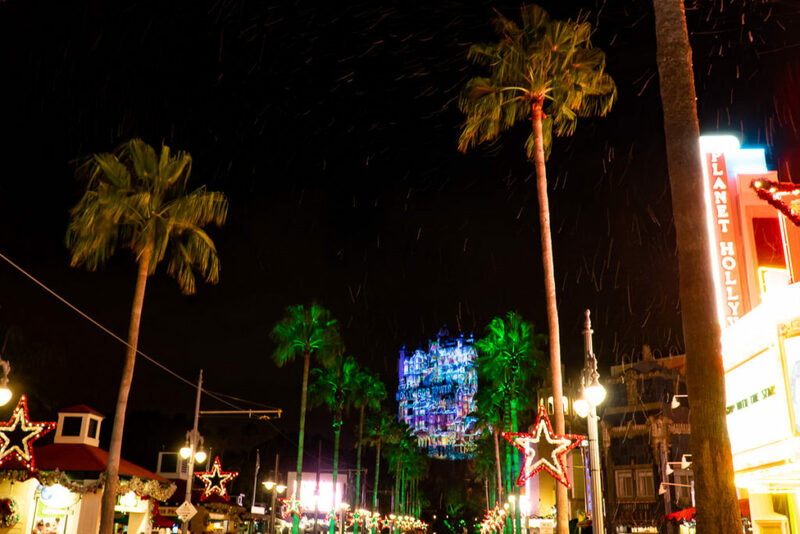 At night, Hollywood Boulevard light up with a laser light show all choreographed to music and with real snow being blown from the tops of the buildings! I mean, it was just spectacular! But even with all of that, the greatest highlight for me came inside the Tower of Terror when it came to our family riding the ride. I have lots of lower back issues and had a flare up right before our trip, so I knew I didn’t want to ride any rides just to be on the safe side and not make it worse. My daughter REALLY wanted to ride the tower, but once we got inside and it was time for Chris to take the kids, she decided she would only go if I went on. I felt so torn and didn’t know what to do. She started crying because she really wanted to go but was terrified to go without her momma. A worker overheard this commotion and offered up some calming reassurance for Leah that the ride was awesome and she’d be fine to ride it without me. Seeing that Leah wasn’t having any of it yet was struggling with the thought of regret if she didn’t go on, the worker (named Emily) offered to ride WITH HER!!! In all my years of going to theme parks, I’ve never seen something like this. 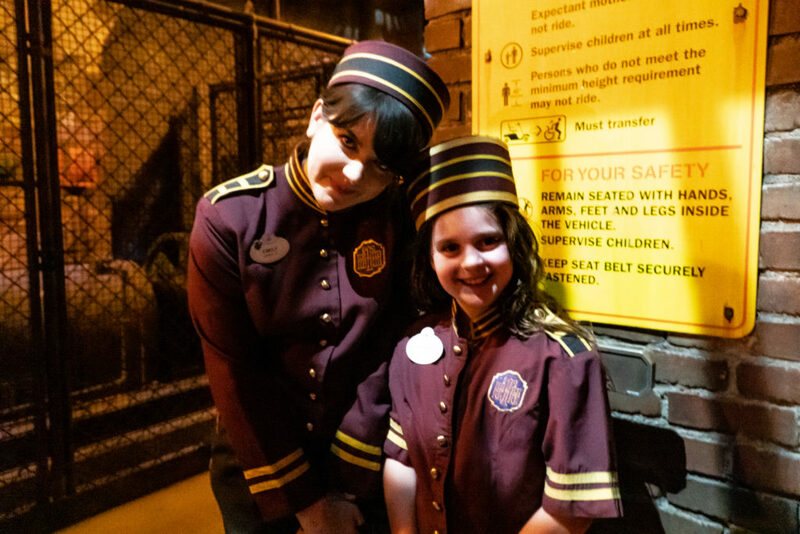 And not only did she offer, she actually got my daughter a matching hotel uniform that all the workers were wearing so she could wear it on the ride! I was then overcome with emotion just watching my daughter light up by the gesture of a complete stranger! She ended up not only riding the ride once, but twice and would have kept going had we had more time! It’s those gestures that make the Disney parks so special. 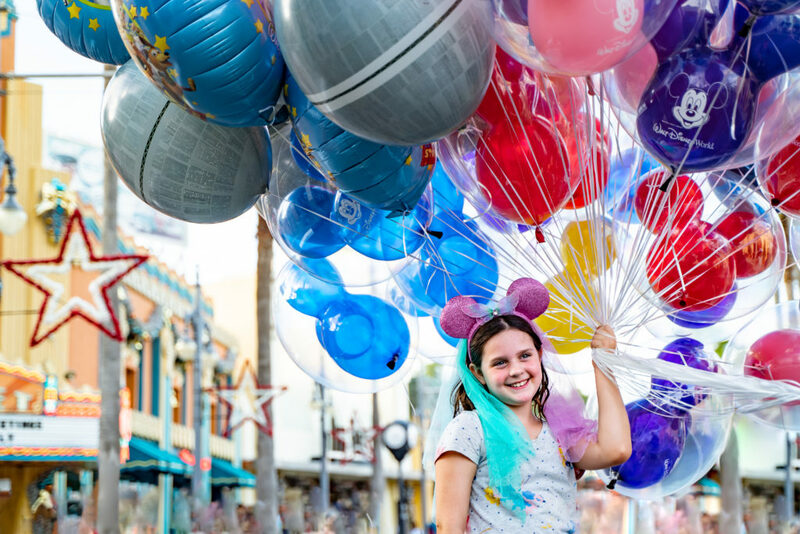 The workers (known as cast members) really go above and beyond anytime they can to make sure your experience at any of the Disney World parks are out of the world! And that is why I will continue to brave the crowds and go back year after year! Because it’s just so darn magical! 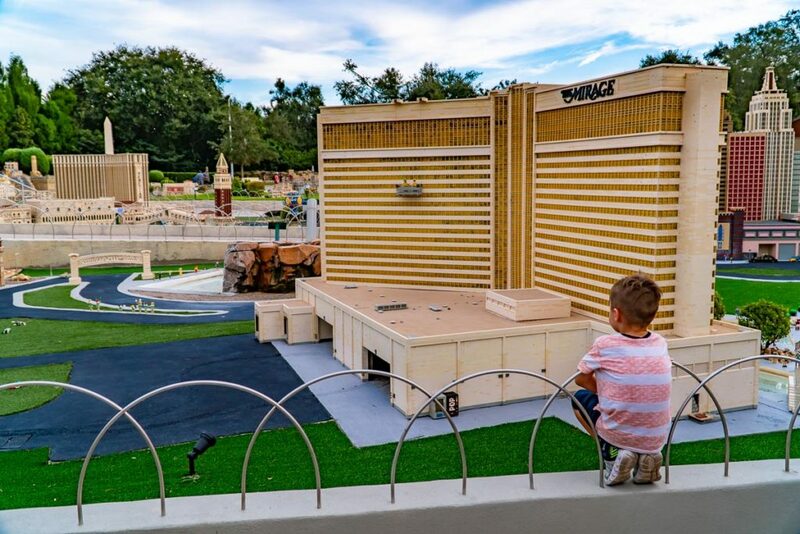 Legoland Florida is one of the newer parks in the Orlando area, being about eight years old. 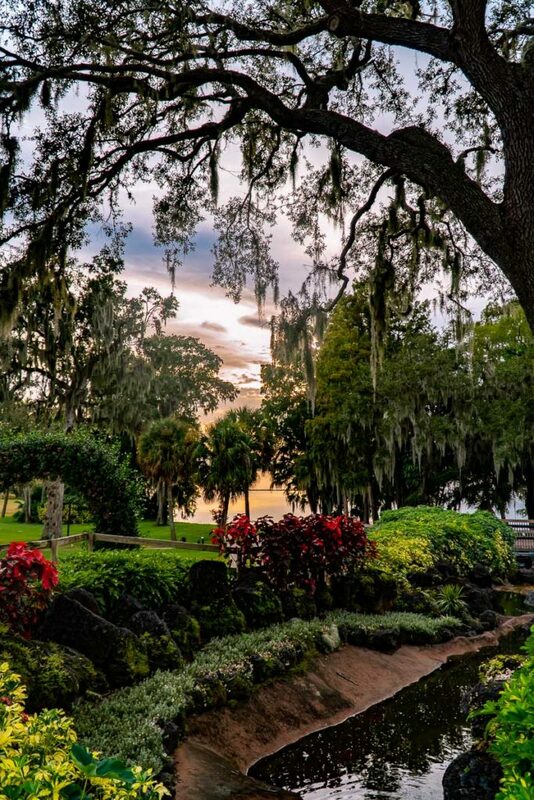 It actually sits on the former site of Cypress Gardens, which explains why the grounds are so lush and gorgeous! There is actually an entire section to the top left of the park that has been preserved from the old Cypress Gardens complete with walking trials to wander through it! It’s gorgeous! My kids are absolutely OBSESSED with Lego! 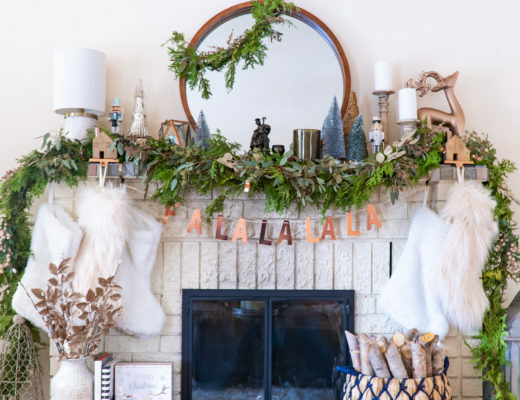 I mean…really obsessed! 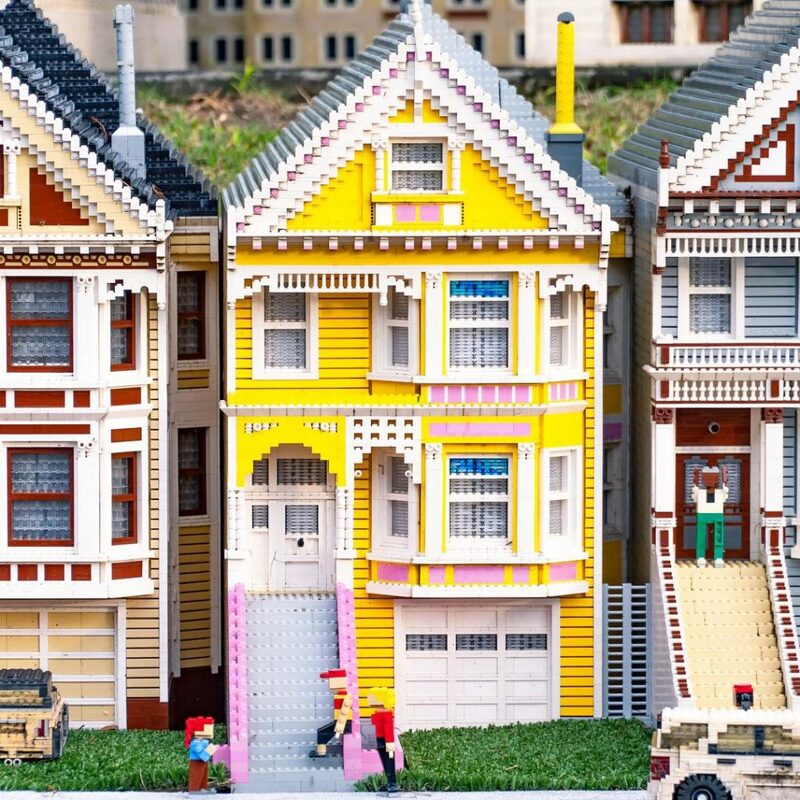 They have just about every Lego character out there and thousands upon thousands of pieces! And yet, they still want more! 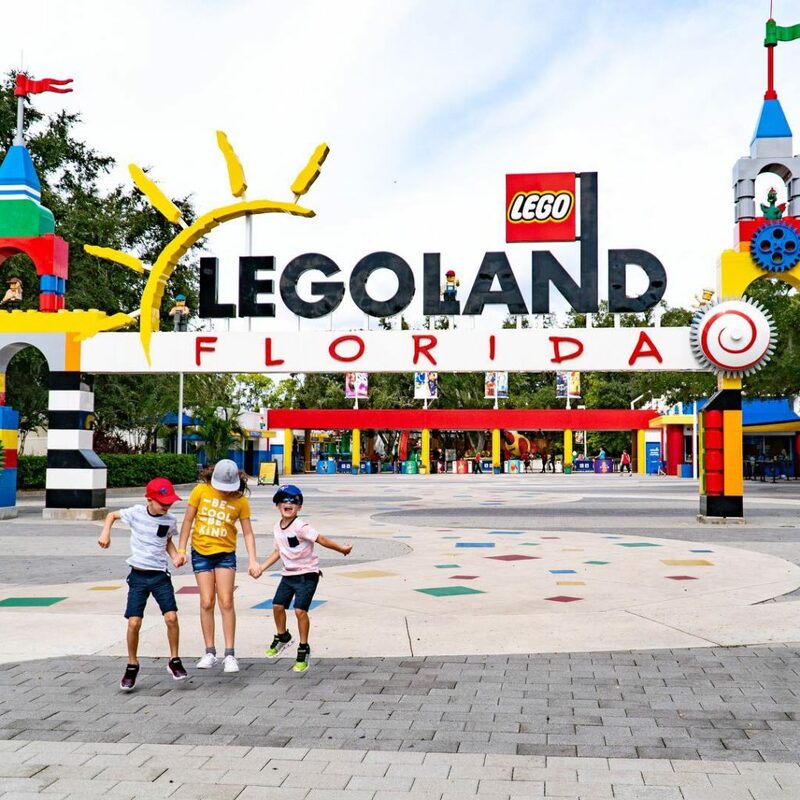 So you can imagine that when they show up at Legoland Florida, it’s like all their playtime at home come to life! From the characters to the various lands, everything is centered around Lego and it’s honestly so much fun! They have a Duplo land for the smaller kids, which our youngest loved. 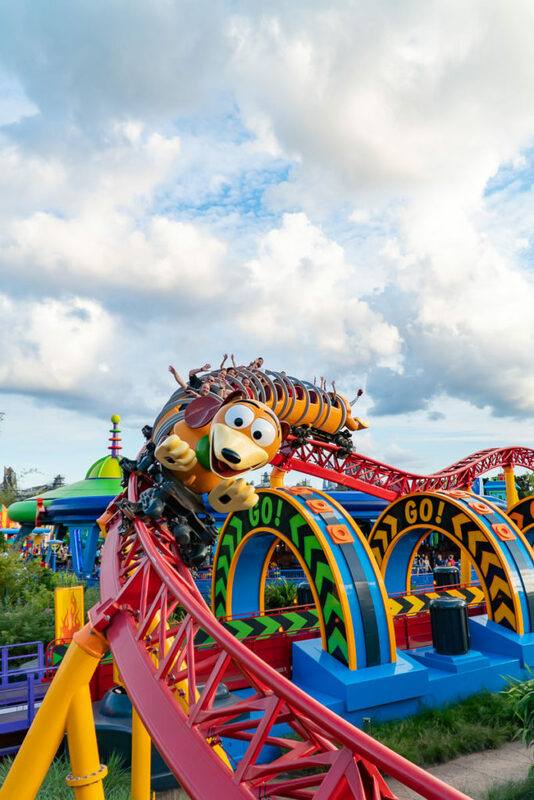 They are also constantly adding more rides and areas to make for an even better experience with your family. We even got to meet Master Wu in the Ninajo world! 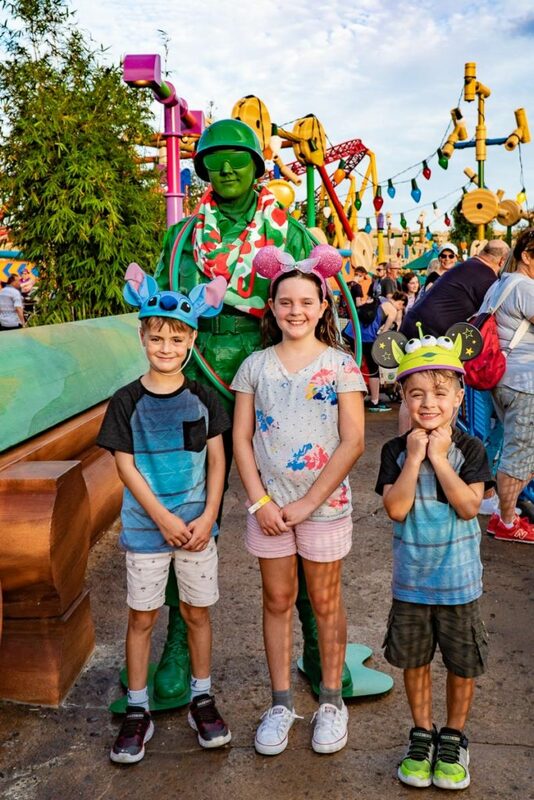 Although we have been to Legoland Florida before, we discovered something new this time around – if you bring a mini Lego figure with you to the park, you can ask any of the workers to trade figures with you and they will! All the workers have one or more mini-figures on their name tags and are always willing to trade. Because we didn’t know this, we didn’t bring any figures into the park, but a couple of really generous workers gave our kids each one so they could trade. This then became part of the fun during the day to go around to the different workers and see if they had better or more unique looking figures to trade! Our middle son ended up getting a really cool World of Chyma figure, apparently one that was really rare, and he was ecstatic. Unfortunately, he ended up dropping it while getting off of a ride and we didn’t notice until later. I decided to try and walk back to retrace his steps and see if I could find it and unfortunately I couldn’t. When I told the workers at the ride what I was looking for, they jumped in to help me look too. While none of us could find it, I was surprised when one of the workers came back with about eight mini-figures that they had randomly collected from others dropping them after the ride and gave them all to me to give to my son! Again, I was so moved by the kindness of a stranger trying to give our family the best experience possible. I excitedly walked back to where Chris was waiting with the kids and showed Gabe all the new figures I had received for him. There was still some time left before the park closed and he was able to trade a bunch of them with some of the remaining workers he came into contact with and left on a high! 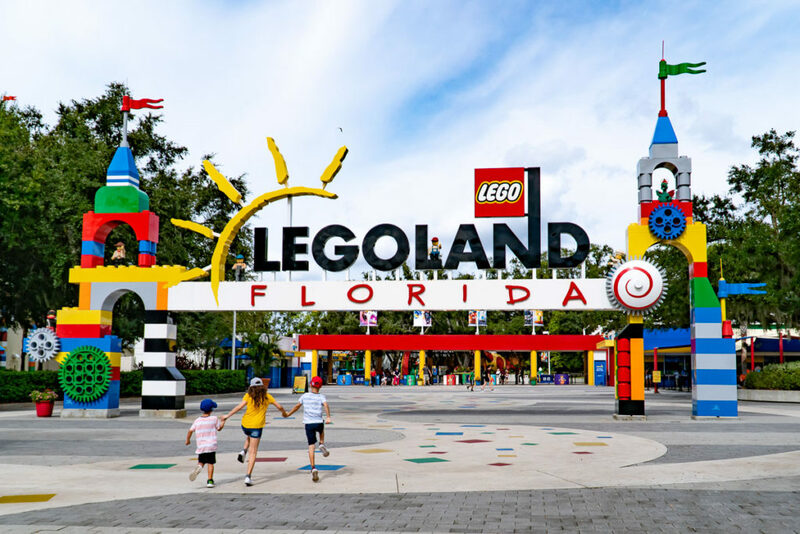 While Legoland Florida isn’t right in the heart of Orlando, it’s definitely worth the short drive! It’s a park that our family visits every year and we already have plans to return again in 2019! 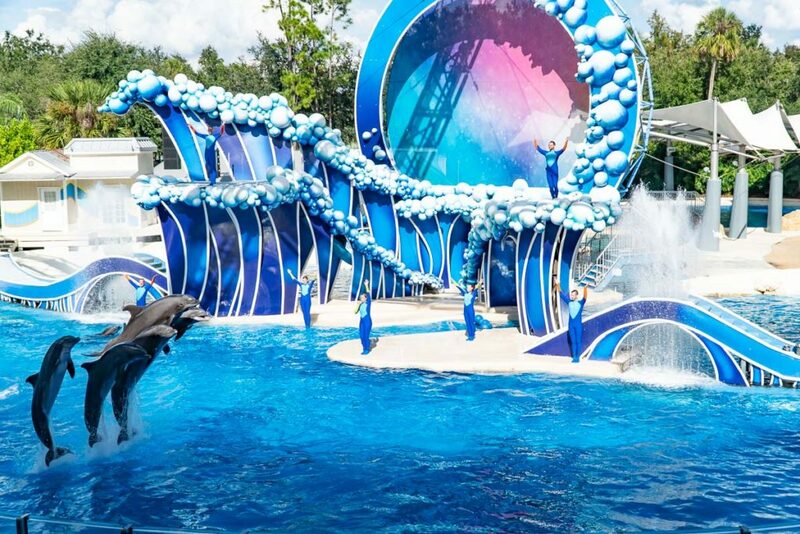 SeaWorld Orlando is a park that I can remember going to when I was younger and absolutely loving. But I will say, when I first told Chris about going, he was really hesitant. He’s an animal lover and has a hard time with the thought of large sea animals, particularly whales and dolphins in captivity. On the flip side, our oldest child has wanted to be a dolphin trainer since she could talk. I’m not even sure where that desire came from at such a young age, but it’s always been in her top five career choices! So I knew it would be a dream come true for her to get up close and personal with the dolphins. We decided to do a bit of research on it and go in with an open mind to learn about their programs and how they really treat the animals. 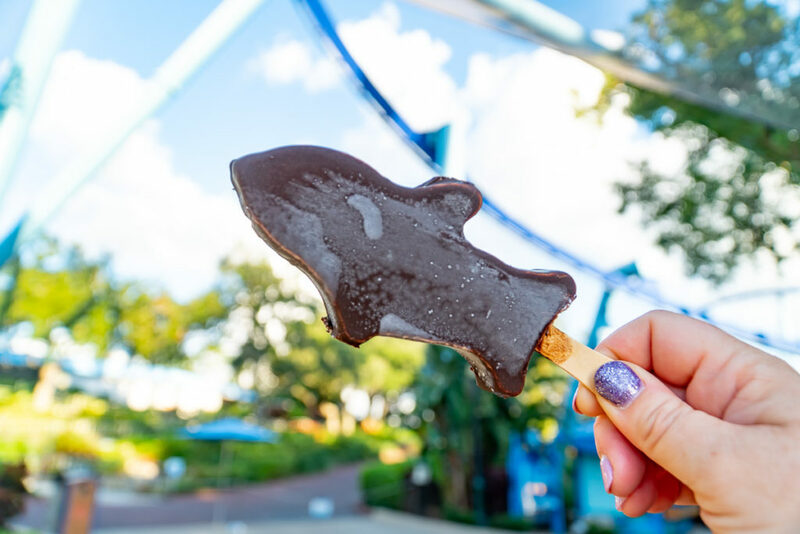 I am so happy to report that we were so pleasantly surprised with SeaWorld Orlando! The thing that stood out to us most was their absolute love and concern for the animals. They take conservation and rehabilitation very seriously. 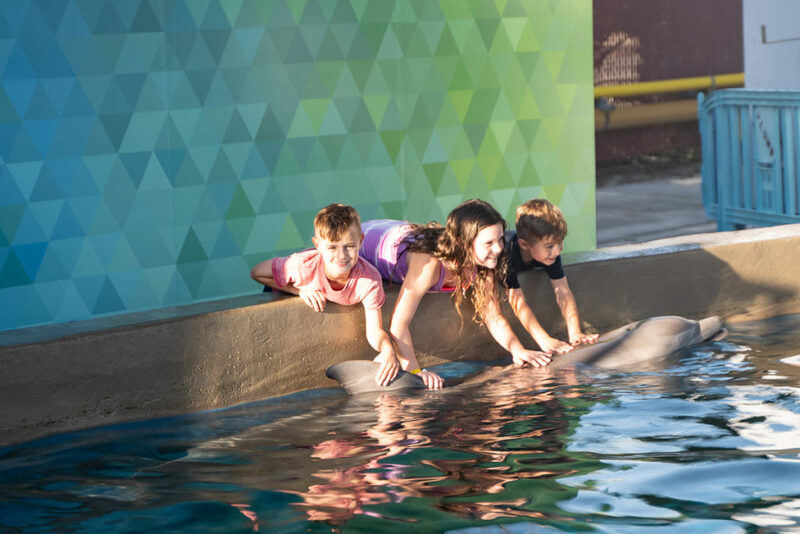 After talking with one of the dolphin trainers at length, we realized just how deep their love for animals goes and that at the end of the day, everyone working with the animals at SeaWorld Orlando wants nothing but the best for them. 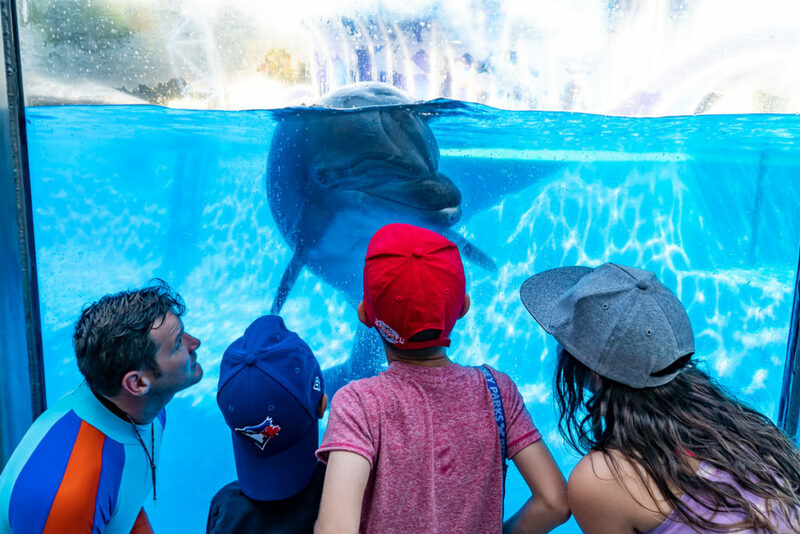 We even got to go behind the scenes to meet some of the dolphins up close and it was incredibly obvious how much love, compassion and care these animals receive on a daily basis. 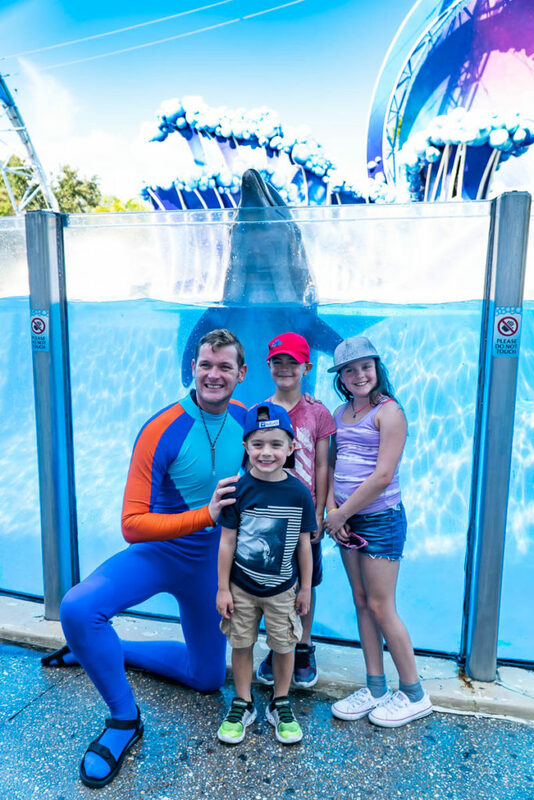 Meeting a real life dolphin trainer was what I’d call life goals for my daughter and after our time at SeaWorld Orlando, all three of our kids wants to grow up to work with dolphins! 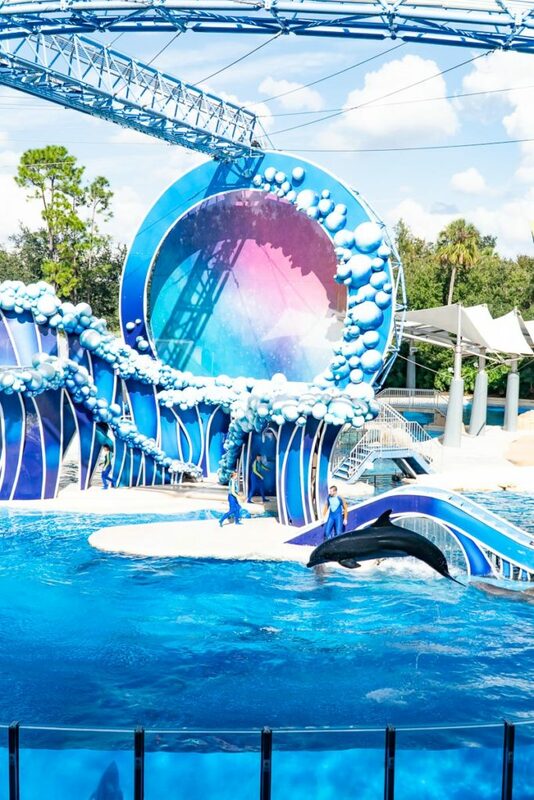 SeaWorld Orlando is absolutely a place we will go back to next time we are in Orlando and I’d highly encourage anyone with any doubts about animal safety and well-being to go visit and meet the trainers in person. I guarantee your mind will be changed like ours was! Admittedly, for as many times as I’ve visited Orlando, I’ve actually never heard of WonderWorks Orlando before. 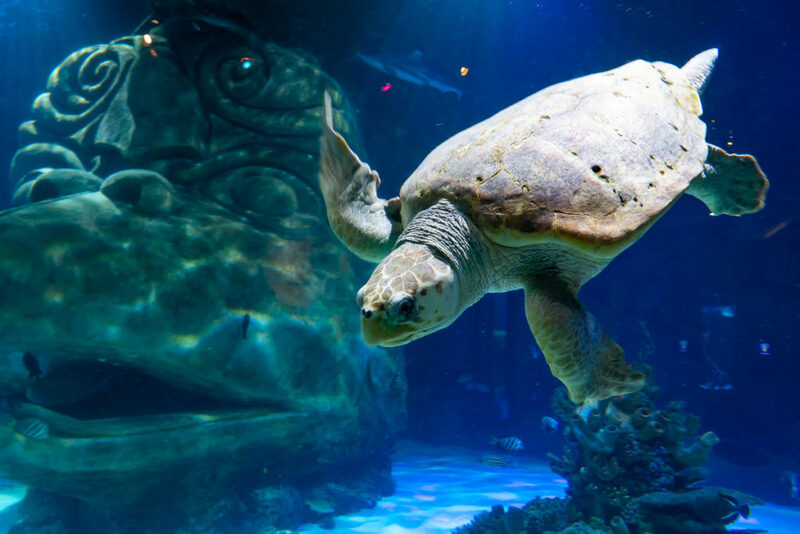 Located on International Drive, WonderWorks Orlando is an indoor amusement park for the mind, combining education and entertainment with more than 100 hands-on exhibits for all ages. 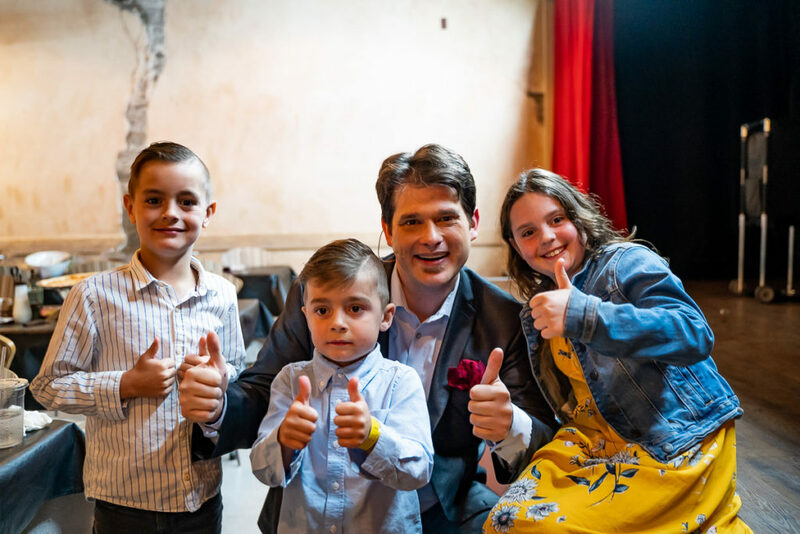 We started the night off with the Outta Control Magic Comedy Dinner Show where we sat at dinner tables and were served pizza, salad and drinks while watching magician Nathan Coe Marsh perform a variety of magic tricks. It was such a neat setting as it was a smaller theatre where the audience was part of the show. Marsh even used Chris’ wedding band for a magic trick! It was so much fun! After the show, we headed into the attractions side of Wonderworks Orlando and were amazed at the different sights and sounds. From stepping into a wind tunnel to experience what a hurricane feels like becoming a human lighting rod, the hands-on experiences were super cool! There was a bubble factory and a nail bed you could lay on as well as a giant life-size light brite you could play with! 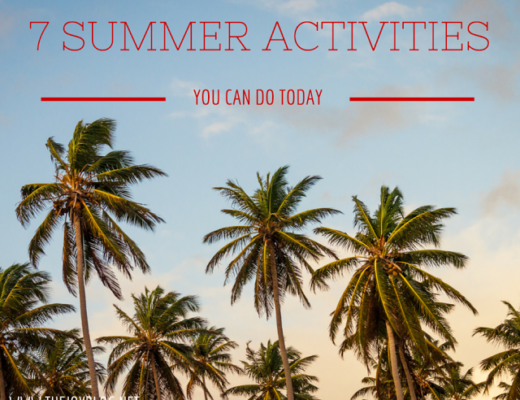 It really had something for everyone and our kids all declared that they MUST visit again! 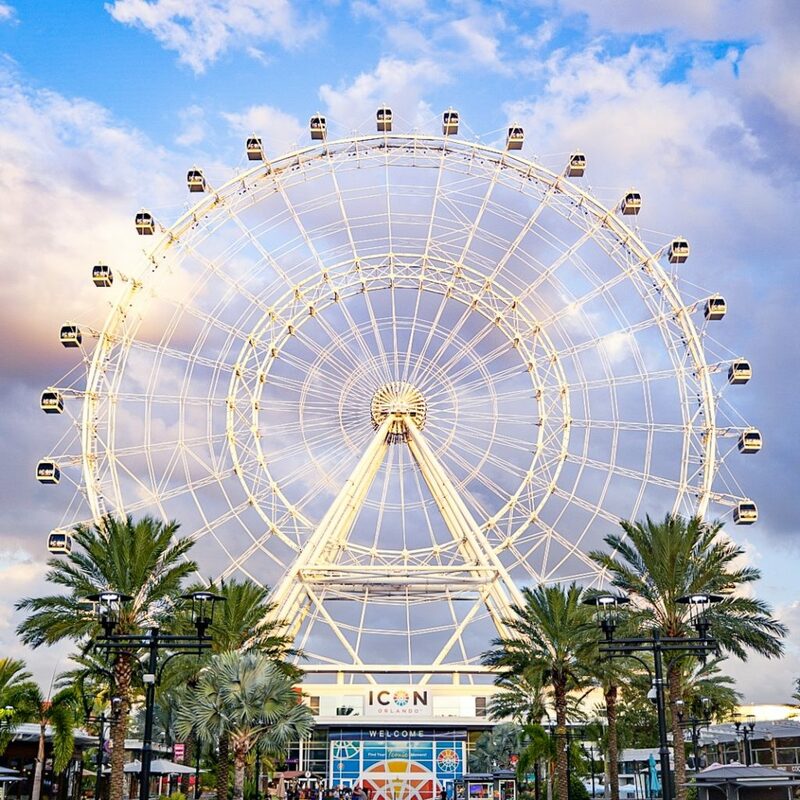 A relatively newer attraction in Orlando, the ICON Orlando is one of the largest observation wheels in the USA, overlooking all of Orlando! 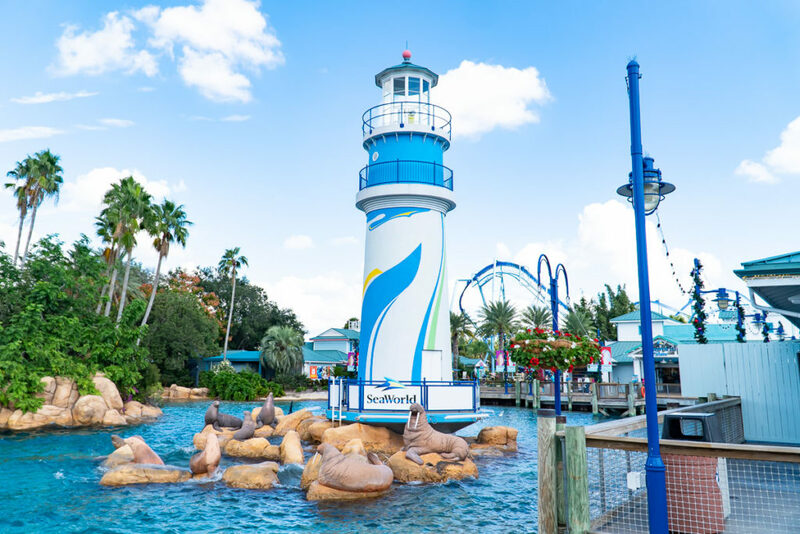 What’s even more neat about this attraction is that you can visit three attractions at once, with Madame Tussauds Orlando and SEA LIFE Orlando Aquarium all being in the same building. But more on those in a minute! 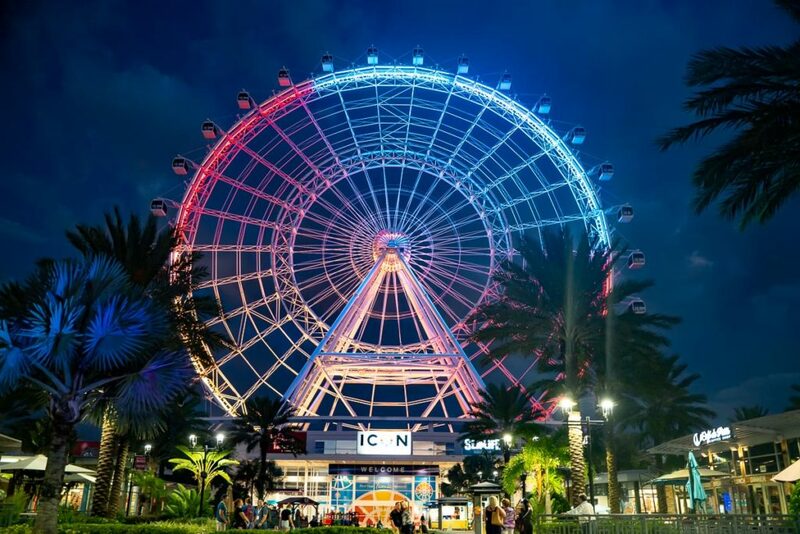 We decided to ride the ICON Orlando for the sunset ride and am I ever glad we did! The ride takes just under half an hour to complete the full rotation and is absolutely spectacular as you get full 360 views while riding. 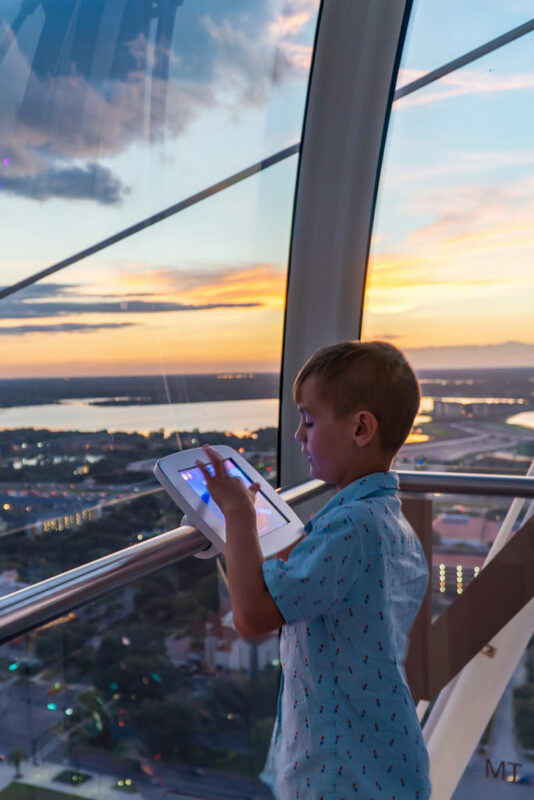 There’s even iPads inside the capsules so you know discover what you are looking at and orient yourself with the layout of Orlando better. 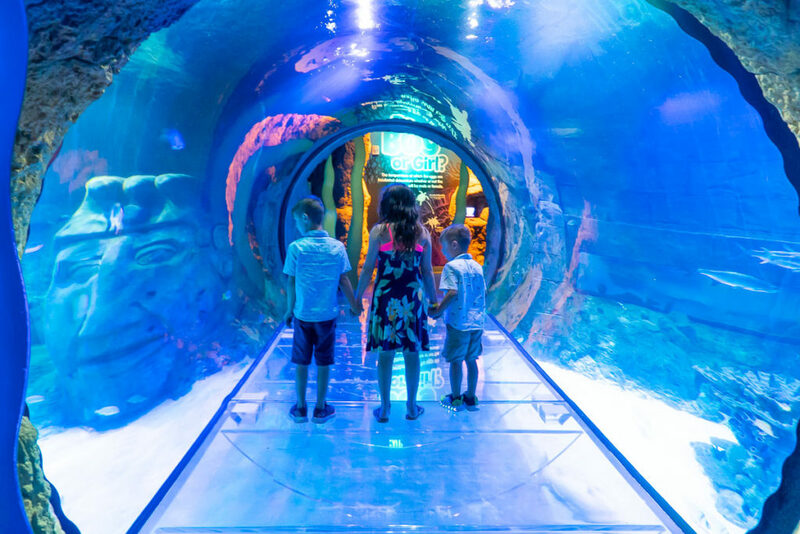 Once the sun had set and we were off the ride, we headed into the SEA LIFE Orlando Aquarium, which boasts Florida’s only 360 degree tunnel where you can watch the sea creatures swim under your feet and over your head! There were lots of interactive stations as we went around to help us learn more about the sea animals. My personal favourite was seeing the sea turtles swim! Those creatures are magnificent! After finishing up at the aquarium, we headed across the building into Madame Tussauds Orlando. I’ll be totally honest, I wasn’t super excited to go inside. 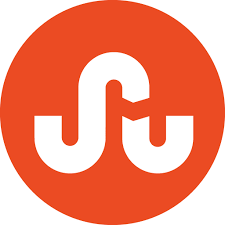 I just didn’t think it would be that interesting. Boy, was I wrong! 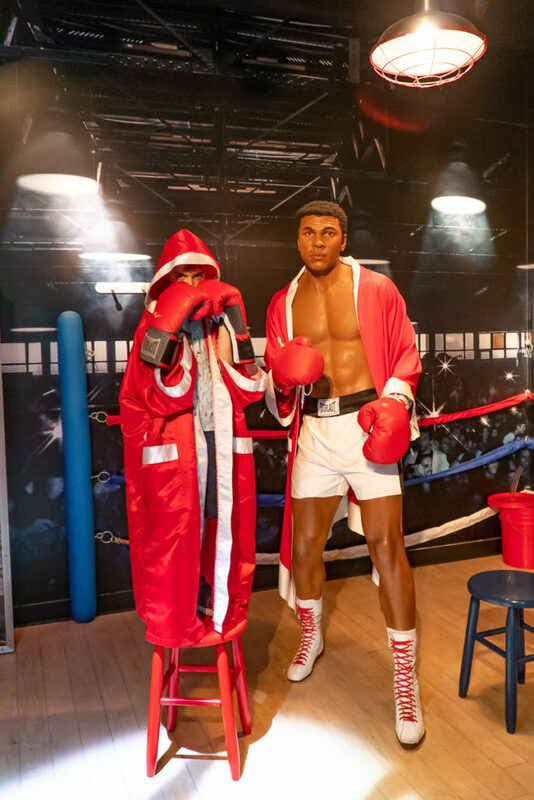 I’m not sure if all wax attractions are set up the same, but what I loved about the one in Orlando was the various sections – they had all the inventors and important leaders, followed by sports figures, celebrities and superhero’s, even including some famous animated characters! 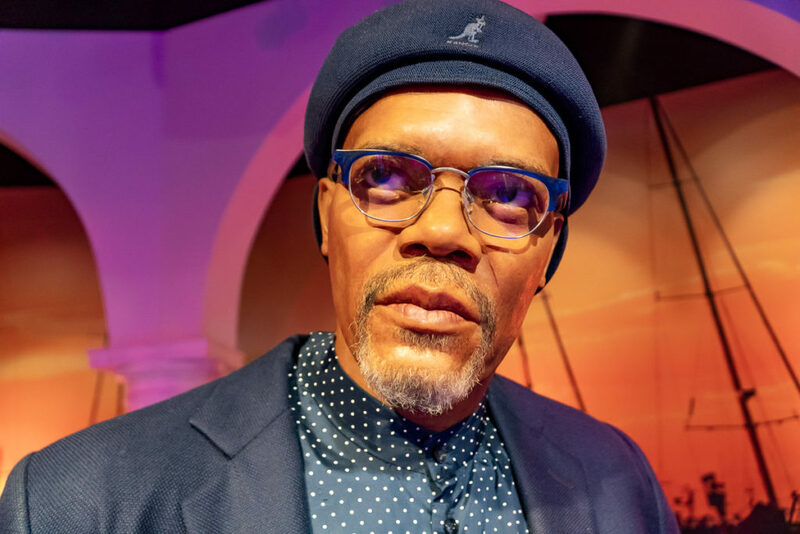 It was such a neat experience to not only see these wax figures but learn a bit more about what they’ve done and why they are famous (especially for the kids). I also loved that you could get right up close and touch the figures. Again, I had thought they would all be roped off, but this allowed it to become an interactive experience, where you could pose with your favourite celebrity or superhero! There were a couple that were SO life like I just couldn’t believe they were WAX! Check out Samuel L Jackson! Insane, right?! There are so many ways to experience the ICON 360, including all the amazing shops and restaurants in the vicinity. Make sure to check out their various combination tickets for all three of the attractions so you too can experience them all with your family! 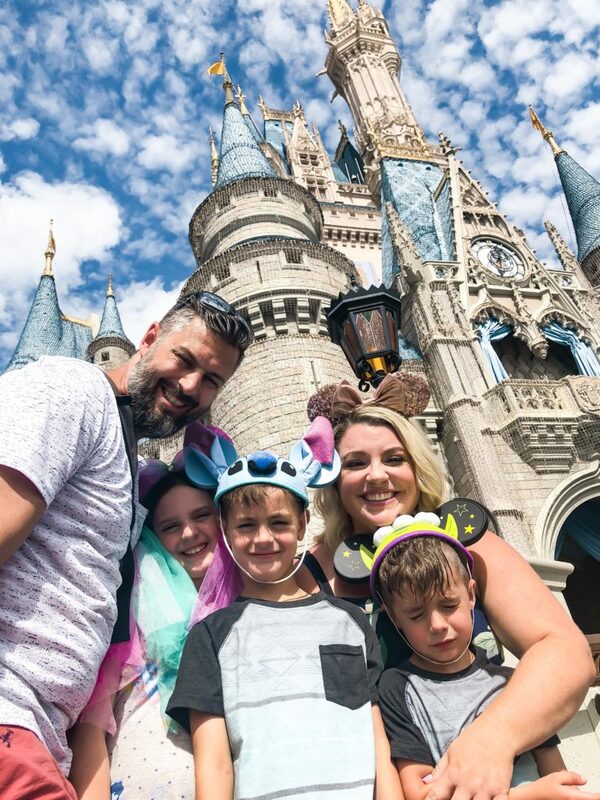 Well friends, as you can tell, we had a VERY full five days in Orlando on this last trip…five days that we will NEVER forget thanks to the incredible attractions, experiences and people of Orlando, Florida. 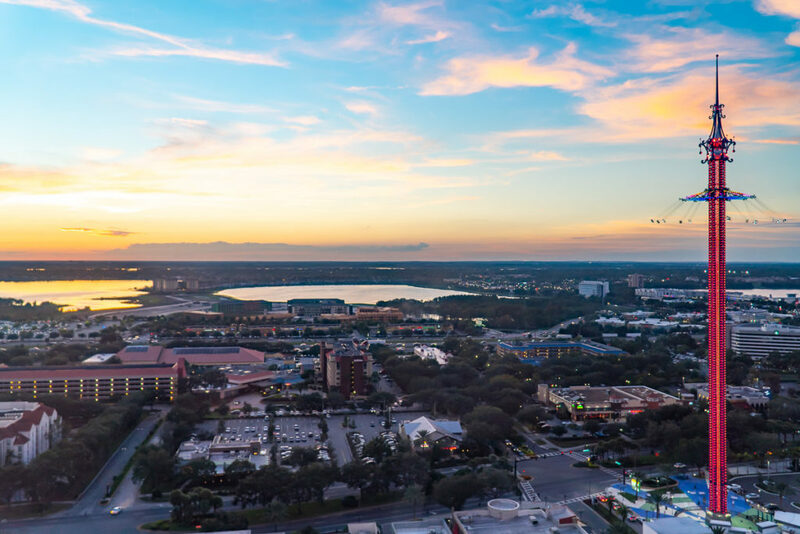 Whether you have a few days or a few weeks, a small or a large budget, a big family or just a couple enjoying a romantic getaway, there is literally something for EVERYONE in Orlando! 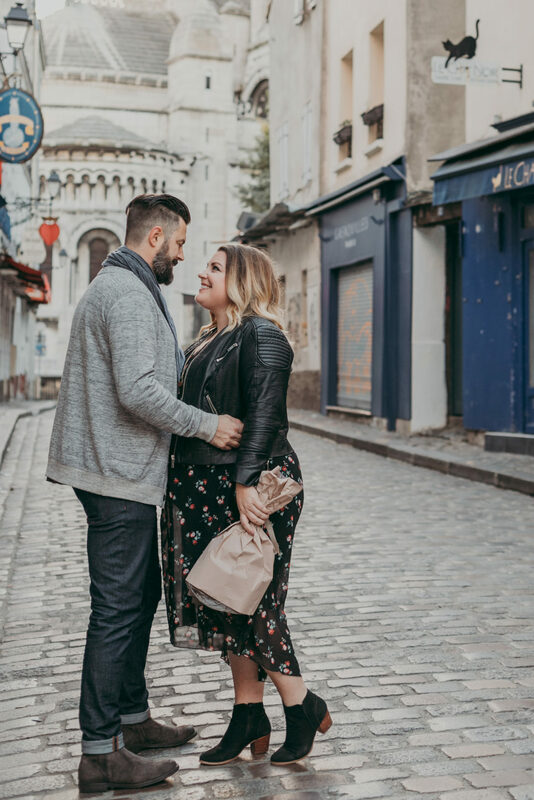 If you’ve never been before, I encourage you to plan your next family vacation there and see why it’s one of the top five most popular tourist destinations in America!